Before we start I’d like to thank The Rain Barrel Depot for sending me two of these kits! Gene has been so helpful and has answered every question I had and even tried to help me find some free barrels! Rain water collection and water storage have intrigued me since I was a child and my dad helped some friends set up cisterns to store rain and well water. He’d even gone out and bought a windmill, hoping to one day have our own well and use the windmill on our mini-farm. I caught the bug for sure. This summer when my berry plants were struggling and my dad told me it was because they didn’t like the city water I started draining the kiddie pool and watering the strawberries with water that had set a while and given the chlorine a chance to evaporate. I realized then, after seeing the difference that made, that I needed to collect rain water. I got two rain barrel kits and was ready to get to work. Long story short, my husband built me a much pricier rain water collection system without the kits because our downspout situation was really weird. But, I saved the kits to use at my in-law’s place because they also wanted rain barrels! This weekend I put one together in under 30 minutes, almost completely by myself! 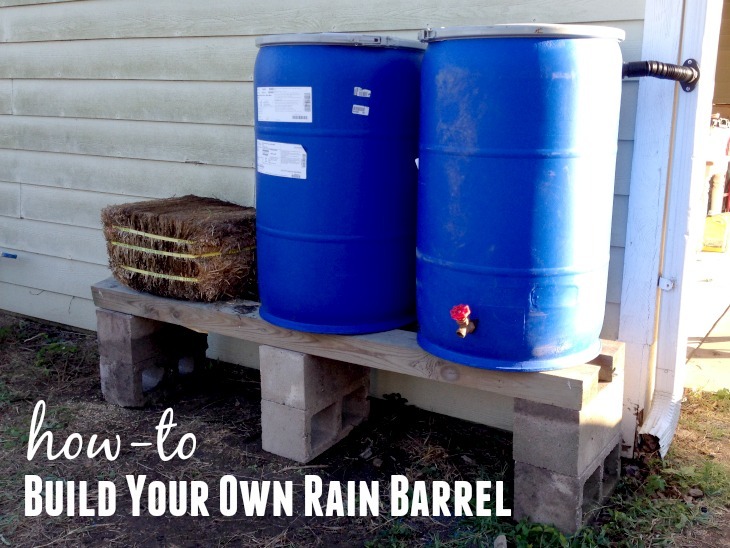 What Do You Need to Build a Rain Barrel? 1. Barrel. If you live near a beverage bottling plant, soup factory, or other food plant that receives its goods in food grade plastic barrels, call them and ask if you can get a few! A lot of times you can get your barrels for free this way! We ended up buying ours from a guy who gets them from Campbel’s Soup, but next time I’m going to call the soup plant myself and ask about them! 2. A stand. You don’t have to have a stand, but it sure will help if you want to be able to get a bucket or watering can under the faucet. The instructions provided by TRBD have you mounting the hose bib about 10″ from the bottom of the barrel so you can attach a hose. But, we used some cinder blocks and a few spare boards to make a frame for ours to sit on so we could get the barrels up off the ground. 3. Hardware. You can get two Do-It-Yourself Rain Barrel Kits with everything you need for just $27.49 each. When I say everything, I mean everything including the bits you put on your drill to cut the holes in your barrels and your downspout. My husband and I were both so impressed with how convenient this was and how we didn’t need to go out and spend extra money buying the tools to put everything together. I have to add this little disclaimer here in case you have to buy a barrel or blocks or wood for a stand. Like I said, the stand isn’t necessary and barrels can usually be found for free. I followed the simple instructions included in the kit and in less than 30 minutes I had a finished rain barrel! We tested it by putting the end of the water hose into the gutter and letting it run a few minutes. Now all we have to do is wait for it to rain and that’s supposed to happen later this week! Here’s an Installation Video for You! This is great!! I’ve been thinking about doing this for a while but had no idea where to start. Great suggestions and ideas, now I have a better idea of what it’s all about :) Pinned! I have been thinking about doing this for some time. Can u please tell where u got the blue barrel from? If u got for free awesomeness yet to find them is free is extremely unexpected my way let alone making sure it is food grade. We found ours at a little rummage sale place. Someone who works at the local Campbell’s Soup plant was reselling them there. Check for a soda bottling plant in your area, or another food place and usually they will give you barrels or sell them to you for cheap! I got mine at a pickle factory in Mich.
What do you do in the winter time. I live in the Northeast and it can get very cold here. Water in the barrel could freeze and crack it. I happened to see someone who used the barrels as a dock flotation device. He was trying to get rid of the for $10 each. I got 4 of them for $30 and he was very helpful with my project. The barrels are sealed nicely but have some barnicles on them. The inside of the barrels were never used. I’m waiting for the spouts now. I can’t wait to hear how your project goes! I have a question? did your barrels have the 2 holes on top or did they have a lid that could be removed? Or did you just cut the top open. I have 4 barrels and I’d like to NOT have to cut the tops off. In other words how did you get the spout connected from the inside? You have to have a hole in the top to get the water in so use a broom stick with duct tape on the end to hold the washer and nut to secure the spigot through that hole?